On Nov. 11, 2014, I visited the Dodgers Adult Baseball Camp at Historic Dodgertown in Vero Beach, Fla., to seek out Jerry Reuss for an interview about his time as a pitcher with the Cardinals. Dressed in a home white Dodgers uniform, Reuss, 65, was patient, thoughtful, articulate and polite. 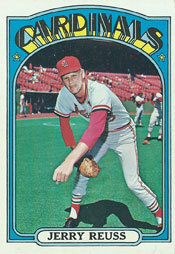 He debuted with the Cardinals in September 1969 and pitched for them in 1970 and 1971, posting an overall 22-22 record before he was traded to the Astros in April 1972. In a 22-year major-league career, primarily with the Dodgers (nine years) and Pirates (six years), Reuss was 220-191 with a 3.64 ERA. In 2014, he published a book “Bring in the Right-hander,” a delightful retrospective on his career. You can order an autographed copy at his Web site www.jerryreuss.com. Q.: Two months after the Cardinals traded Steve Carlton, they traded you. It was first reported you were traded because you were in a contract dispute with owner Gussie Busch. Later it comes out it was about your moustache. True? Reuss: “It was about growing a moustache. Bob Broeg (a writer) had said something to that effect and I thought, ‘No, they wouldn’t be that concerned about that.’ I lived with that for 20 or 25 years. “It wasn’t until the mid-90s when I was in St. Louis and I went to a ballgame and I saw Bing Devine, who was working as a scout. He had been the general manager of the Cardinals when I was traded. I said, ‘Bing, you got a minute?’ He said, ‘Yeah. Why don’t you sit down and we’ll talk.’ So I asked him about the deal. I figured enough time had passed that I could do that. “He was more than happy to tell me. He said Mr. Busch at times would act on an impulse. This was one of those times. He insisted on me being traded because I had the moustache. Bing thought if given a little time he (Busch) would come to his senses and make a wise baseball decision rather than a personal decision. Reuss: “Yeah. But when you look back about how that was the thinking in baseball in the early 70s and then just two or three years later baseball began to change with the times. Guys were coming in with long hair and beards. And you just wonder: What was the stink all about? Q.: Your last year with the Cardinals, 1971, was the year your teammate, Joe Torre, led the National League in hitting and RBI and won the MVP Award. Could you see then the leadership qualities that later would make him a Hall of Fame manager with the Yankees? Reuss: “Oh, sure. Lights out. At that early age, I just wondered whether there were guys like that on every team. “Sometimes there was a lineup that was put out and Joe would go to Red and say, ‘This player won’t say it to you but he’ll say it to me. You might want to give him a day off.’ And Red would say, ‘All right. Let’s do that.’ He’d make the lineup change. Joe was able to get those things from players and he did it only because it helped the club. It wasn’t anything personal with the player. Q,: After leaving the Cardinals, you played for seven big-league teams. As a St. Louis native who began his career with the hometown team, did you ever hope to return to the Cardinals? Reuss: “I never gave it a whole lot of thought. Once I got to Los Angeles (in 1979), I said, ‘This is home. This is where I want to be.’ It’s where I always wanted to play. “Back in those days, it was one of the few grass fields. Lots of artificial turf then. My knees were feeling it. And then I became a ground ball pitcher and the infield I had behind me was particularly adept at playing at Dodger Stadium on the lawn. Q.: .244 in the regular season. (29-for-119). Q.: What was your secret?